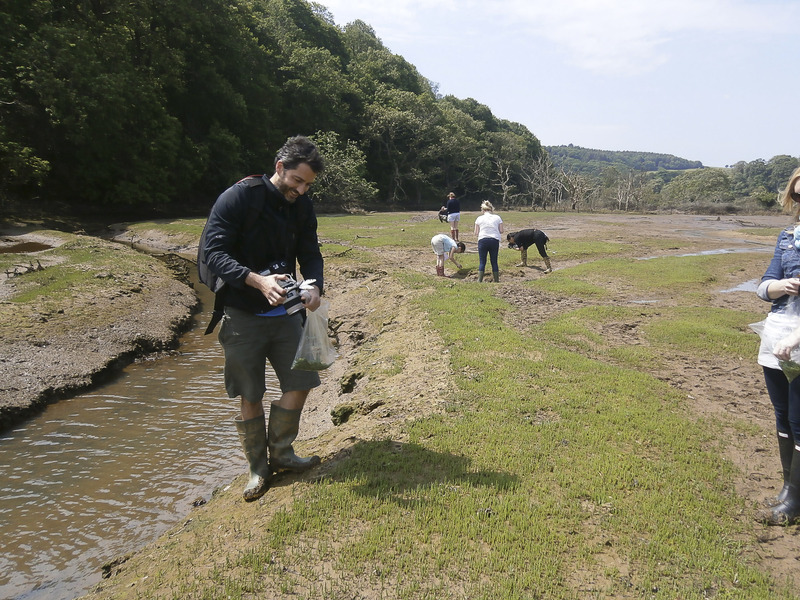 When Guy set up th e farm here in Devon he made a point of planting native fruit trees around the place, as much to boost biodiversity as for how they contribute to making it a beautiful place to work and visit. Every autumn the field margins, hedgerows and even the driveways have boughs heaving with sloes, crab apples, quince, hawthorn, elderberries, rowan and medlars, which staff and visitors are free to help themselves to should they be keen. 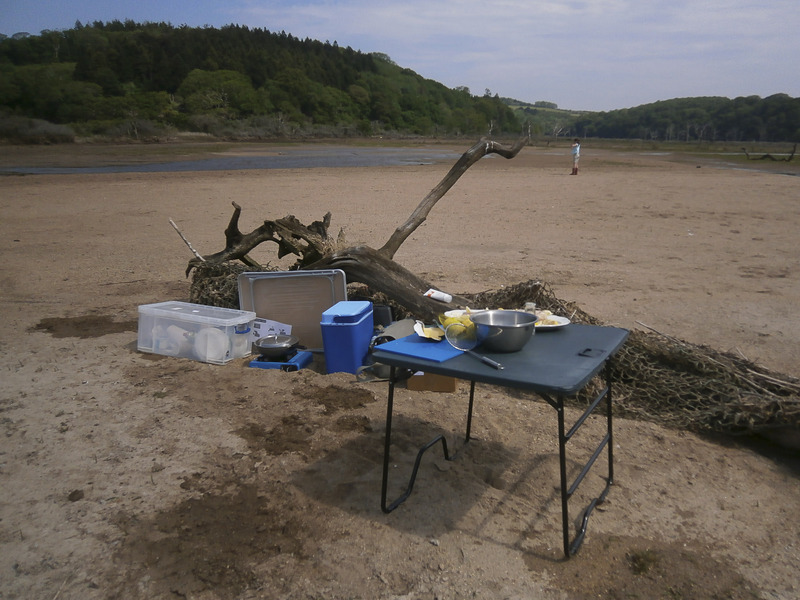 This year we took it one step further decided a staff foraging and preserving event would be good fun. 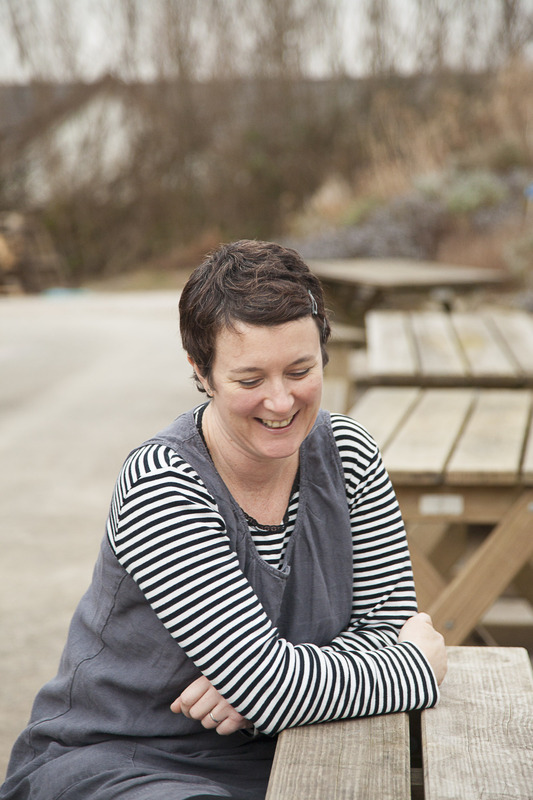 To this end various members of our marketing, finance, IT, customer services and recipe box teams gathered after work one October evening, to learn from our Riverford recipe matriarch, Kirsty Hale. 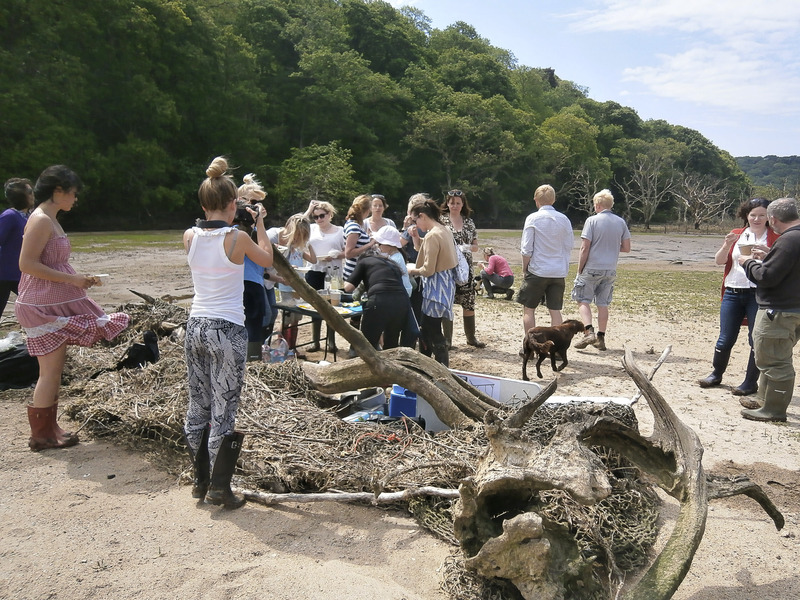 After splitting into foraging teams and armed with bramble shears and gloves where necessary, we spread out across the farm; some down to the old rhubarb field margin, some up by the reservoir, some to the cardoon field and some to the medlar tree in the car park. 45 minutes of competitive picking (in some cases) later, we reconvened in our recipe development kitchen and under Kirsty’s instruction, set about preparing our quinces to make quince Ratafia; quince gin or vodka. As you can see from the pictures, it was organised chaos and brilliant fun, with a loud buzz and clatter of chat, peeling, grating and chopping. In case you are not familiar with it, quince is a beautifully perfumed fruit that brings light, almost floral notes to whatever it is blended with. It is the one fruit you really can’t eat raw; it’s just rock solid and unpalatable. However when baked or poached its texture is transformed to a dense, jelly-like finish, though our aim with this exercise was simply to swipe its beautiful notes to create a festive tipple. We love talking about veg, but it was good to do something a bit more social with each other for a change! Cut the quince into quarters and roughly pick out as many pips as you can. Coarsely grate (or use a processor) and transfer to your sterilised, cold bottle. You want to fill it approx. ⅓ full (exact ratios below). Add sugar, ground cinnamon and nutmeg or mace, top up with booze and seal. Leave for at least 2 months, longer if you can (up to 1 years, even 18 months). Gently turn it now and then, about every week, so the sugar slowly dissolves. Strain through muslin for the best finish and decant into cold sterilised bottles. You can also make lovely booze with: Sloes (freeze overnight or prick with a pin before adding). A few drops of almond or vanilla essence is good with this, damsons or plums (prick several times), crab apples (use leftover pulp from making jelly), medlars, and many other fruits. Use – on its own, or over ice. Or top up with tonic, lemonade or bitter lemon (sloes or damsons are very good with bitter lemon). Make cocktails or pour over ice-cream or desserts. Experiment and enjoy! Put the fruit in a large pan with 1.2 litres of water. Bring up to a low boil. Cook the fruit until very soft, approx. 15-20 mins or so. Ladle the contents of the pan into a suspended muslin jelly bag. Leave to drip for several hours (or overnight). Don’t squeeze or press it or the jelly will turn cloudy. Measure the juice. For every 600ml juice you need 450g sugar. Transfer the juice and sugar to a preserving pan (a very large heavy-based stainless steel saucepan is fine to use). Heat the pan gently until the sugar dissolves. Bring to the boil, boil for 10 mins. Test for a set – put a dessertspoon’s worth on a cold saucer. Leave for 20-30 secs, then push it with your finger. It should ripple when the set is ready. If not set, repeat the boil and test at 10 minute intervals, until you get the ripple effect. Skim off any scum from the surface. Pot the hot mixture into hot sterilised jars. Seal, turn upside down for 5 mins to sterilise the lids. Label when cool. The pots should keep for up to 1 year. You can use the leftover drained mushy apples to make crab apple vodka or gin. Add a little chilli to the apples/berries when steeping. Pop a little star anise in with your finished jelly – the anise flavour is really good with pork and game. There was a bit of a green-fingered rummage in the office on Monday as we gathered up some of the seedlings rejected for not being quite up to scratch for our Box to Grows. Some also go to local schools for their garden projects, and I hope the Totnes Incredible Edible scheme might get a few too; they plant unused spaces around the town with veg and herbs for residents to pick for free. Those seedlings probably stand a pretty good chance of surviving, but for those heading for my garden, good luck to them! I only have a courtyard garden, but it’s amazing what you can fit in; even artichokes will grow quite happily in large pots. As I have such a small space, I only grow things I can eat, particularly herbs, as I use bucket loads of them. My blueberry bush, which has survived my murderous attempts for 3 years now, amazes me each summer by offering up a bumper crop. Blueberries seem to grow really well in Devon; they even manage to grow them up on Dartmoor. Mine is only just blossoming, but we have the first of our blueberries available now. 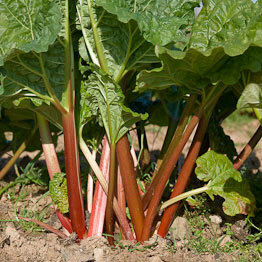 Plumper and sweeter than supermarket berries, they’re good with porridge or granola and yoghurt for breakfast. Or try this easy blueberry & yoghurt cake (below), delicately flavoured with a little almond and lemon. It can be made with gluten-free flour too, for those with an allergy. I’m not a huge fan of meringues, but I love the delicate flavour of saffron, which pairs well in our recipe for saffron meringues with blueberry compôte (below). The meringues also go well with poached pears. If you want to make a gluten-free cake, Doves Farm make a gluten-free self-raising flour, although it isn’t organic, but you could use gluten-free plain flour with baking powder if you prefer. Preheat the oven to 180C. Grease a 20cm cake tin with a little butter on a piece of kitchen paper. Line the base and sides with baking parchment. In one bowl, mix together the flour, salt, sugar, ground almonds and lemon zest. In another bowl, lightly beat the eggs, then stir together with the yoghurt, butter and almond extract. Pour the egg mixture into the dry ingredient bowl. Stir until all the ingredients are just combined. Add the blueberries and gently stir them in. Pour into the tin, level it and bake for 50 mins or until just cooked through and golden brown (insert a skewer or cocktail stick in the middle, it should come out clean). 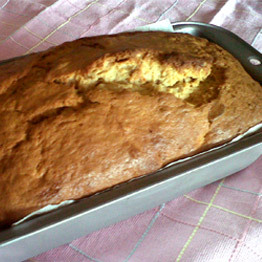 Let the cake cool in the tin for 15-20 mins then turn out onto a cooling rack. Preheat the oven to 180C. Line a baking sheet with baking parchment. Put the saffron in a small heatproof bowl. Add 2 tsp boiling water and leave to steep. Crack the eggs and tip each half of the shell from side to side over a small bowl to separate the whites from yolks (do this one at a time into the bowl, in case the egg whites and yolks mix together, transferring the egg whites to a large clean, dry bowl. 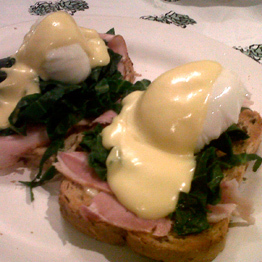 Save the yolks to make mayonnaise or hollandaise. Whisk the whites until they form stiff peaks. Gradually add the sugar, 1 tbsp at a time, until the eggs are stiff and have a satin looking sheen. You should be able to tip the bowl upside down without them falling out! 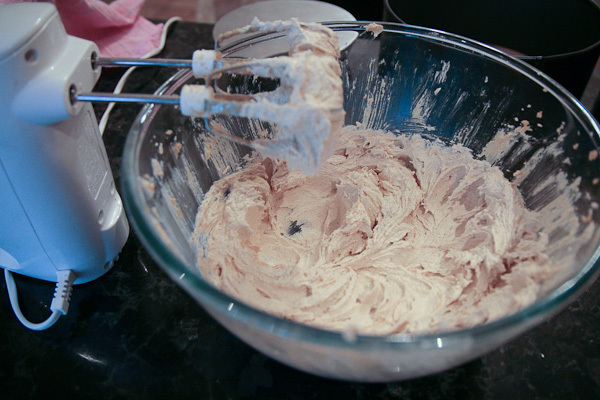 Don’t over whisk though, or this will cause the egg whites to break down and the meringues will turn soggy in the oven. Strain the saffron liquid; discard the strands and keep the bright yellow liquid. Add this to the meringue with the cornflour and vinegar. The cornflour and vinegar help the insides of the meringue have a marshmallowy rather than powdery texture. Whisk until just combined. Use 2 dessert spoons to make 8 similar sized oval dollops on the baking sheet. Turn the oven down to 120C and pop the meringues in the oven. Cook for 1 ½ hours or so, until the bottom sounds hollow when tapped. Turn off the oven and leave the meringues in there to cool completely. This will stop the meringues from cracking. To make the compote, put half the blueberries and the sugar in a small saucepan with 2 tbsp water. Heat gently to dissolve the sugar, about 4-5 mins. Add the lime juice and strain the mixture over a sieve. Stir in the rest of the blueberries. Serve the meringues sandwiched together with cream, with the blueberry compôte. I’ve been asked to write about ‘stir up Sunday’, the traditional day when you’re supposed to make your Christmas pudding, gathering the family round to stir it and make a wish. Stir up Sunday is on the last Sunday before Advent; this year it’s the 25th November. I took on the mantel of making the family pudding a few years ago, taking over from my beloved Nanna. But as we want you to buy our ready-made Christmas puddings (granted, they are good), I’m not allowed to tell you the recipe for that, although I may get rebellious and start a secret pudding club! 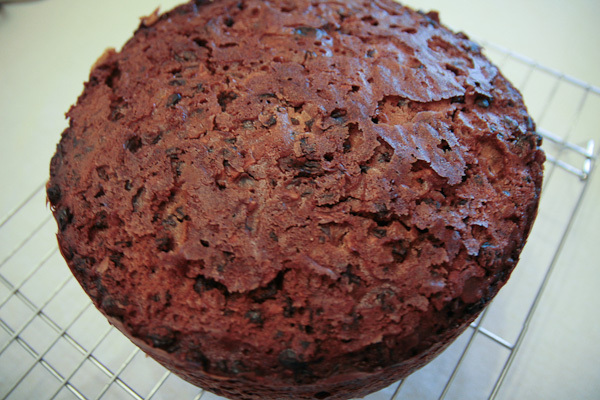 Instead, here’s a Christmas cake recipe, which we don’t sell. This is an adaptation of my mum’s cake, which is always really moist. She has even been known to make it in a festive panic the day before Christmas Eve, adding a glug more brandy, and it still tastes good! 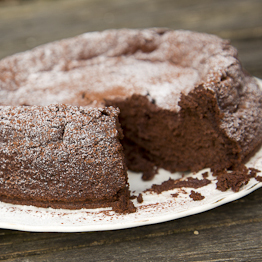 If you are making this a week or so after Stir Up Sunday, just feed the cake every 4-5 days instead of every week. Make it, wish on it, and a star or two for extra luck. Feed it, love it, and we’ll tell you how to make your own marzipan, icing and decorations in a couple of week’s time. You do need to start soaking the fruit for pudding or cake the day before, so the process really starts with soak it up Saturday – I’ve shared this recipe in two parts; part one – preparation and baking, part two – making your own marzipan (it’s really very easy!) and icing the cake. Suitable stirring tunes: Elgar, or Bob Marley. He’d probably rather you used rum. And that would be fine. You will need a 20cm/8 inch round cake tin or an 18cm/7 inch square tin; the cake will cook to about 6-7cm deep, so check your tin is deep enough to hold it, sometimes the average Victoria sponge tin isn’t deep enough. 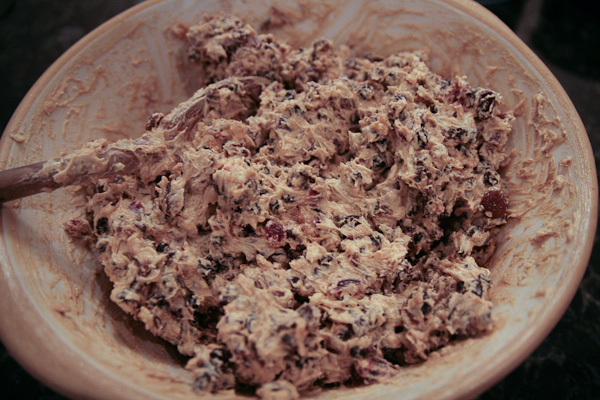 Put the dried fruit, cherries and mixed peel in a large bowl. Pour over the brandy and stir together. Cover with a clean tea towel and leave to soak overnight. Preheat the oven to 140c (if you are using a fan oven, reduce the temperature to 120c or it will cook too quickly and burn). 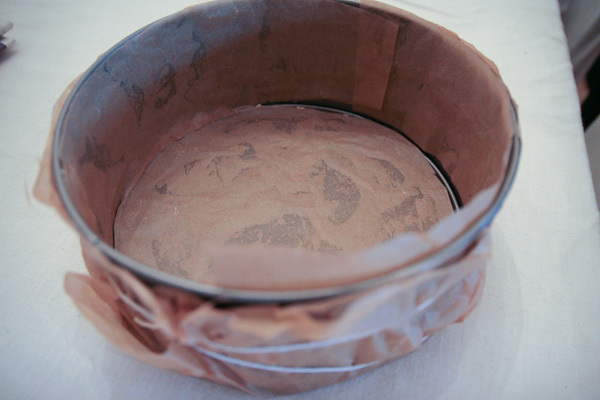 Prepare your cake tin: line the outside of the tin with 3 layers of greaseproof paper tied with string to protect it. Use a piece of kitchen paper to grease the inside of the tin with a little butter. Cut a round piece of greaseproof paper to line the base of the tin, then a long strip to line the side – use a little greasing of butter to stick a couple of strips together if you need to. Cut a round double layer of paper, enough to cover the top of the cake. Cut a small hole in the middle of it to let the steam escape. In a large bowl, whisk the butter and sugar until pale, light and fluffy (use an electric hand whisk if you have one, it’s easier). Lightly beat the eggs in a small jug or bowl. Gradually add them to the creamed butter and sugar. Don’t worry if it looks a bit curdled. Add the flour, salt, spices, nuts, zests and treacle. 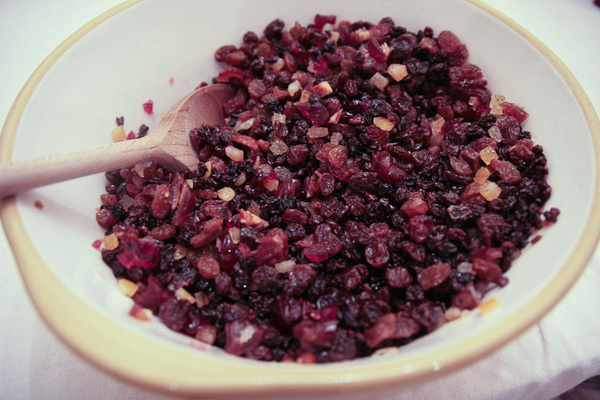 Stir to combine, then add the brandy-soaked fruit, together with any liquid in the bowl and stir together. Try not to over-mix it. Transfer the mixture to the tin. Level it off and cover with the double piece of greaseproof paper. Bake on a low oven shelf for about 4 hours (140c in a standard oven or 120c if fan), depending on your oven – start testing it after 3½ hours, then at intervals, by inserting a skewer or cocktail stick into the middle of the cake – it should come out clean. 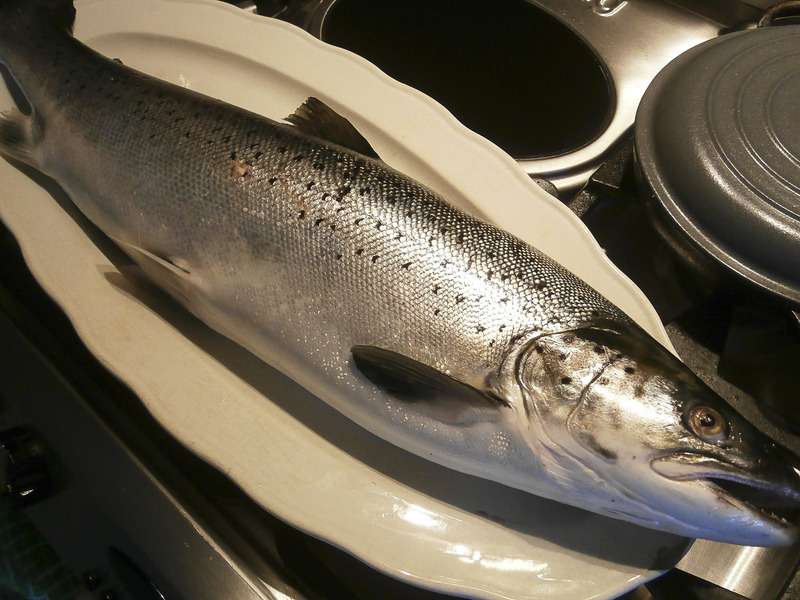 Remove from the oven and leave to cool in the tin for 30 mins. Transfer to a wire rack to cool completely. 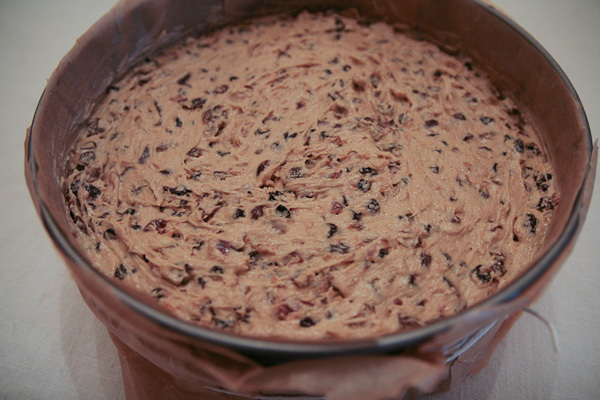 Wrap the base and sides of the cake in foil and place in an airtight container. Prick the top of the cake several times with a skewer or cocktail stick. Drizzle over a little brandy, about 1 tbsp. Seal the container. 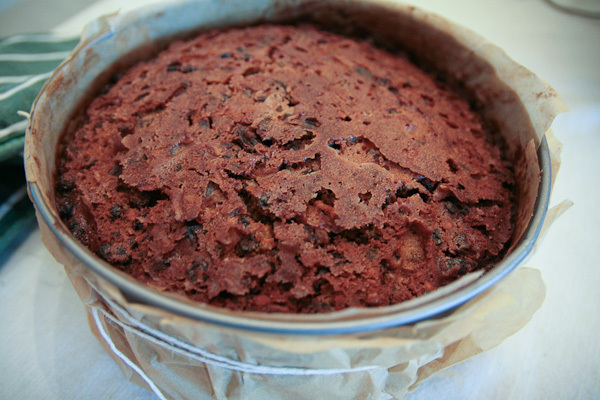 Unwrap and feed the cake once a week for 3 weeks with a drizzle of brandy; about 1 tbsp each time. It’s then ready to decorate. I’ll be sharing my recipe for making your own marzipan (much simpler than you’d think) in the second week of December when the cake will be ready for covering. In our house, my giant hound and I share different views on Hallowe’en and Bonfire night (or whatever you want to call them) – even before we get into the commercial nonsense debate. I don’t like yo-yoing up and down to feed the trick or treaters, but he loves the attention every doorbell ringer gives him, even if they look like Freddy Krueger. I’m crackers for a firework, while he needs a sedative to get him through the season’s unidentifiable bangs. Neither of us is that fussed about eating pumpkin though, particularly when there’s tastier squash around – however, if you took away an impossibly large orange orb from one of our Riverford Farm Pumpkin Days last weekend and you’re wondering what to do with all the innards once it’s carved, don’t dump them in the compost. Soup it up with curry spices or ginger to warm your hands in between lighting sparklers, or try this pumpkin and pecan loaf. The puréed pumpkin keeps the loaf moist and it’s easy to make, so it’s good for baking with the kids. To make your pumpkin purée, steam pieces of pumpkin flesh until tender. 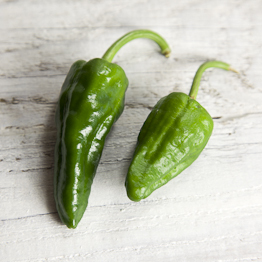 Leave in a colander to cool and drain off the excess moisture, then blitz in a food processor until smooth. Butter a 1 litre loaf tin and line it with baking parchment. Put the butter and sugar in a large bowl. Beat together until light and fluffy (use an electric hand mixer if you have one, it’s easier). Stir in the pecans and pumpkin purée. Add the flour and cinnamon and stir to combine (don’t over mix it). Stir in the milk. Pour into the tin. Bake at 180C for 50-60 mins, until a skewer inserted into the loaf comes out clean. Cool in the pan for 10 mins. Turn out onto a cake rack and leave to cool completely or serve slightly warm, in thick slices. At this time of year I usually keep a batch of rhubarb compote in the fridge to have for breakfast with granola and yoghurt. I sit on the back doorstep in the sunshine and watch the giant hound lie all over my newly planted herb beds, perhaps as some sort of protest at me going to work. This year we’ve not yet tried granola or herb squashing, and are dashing out for the morning walk between the torrents. Apparently the cold weather means people are liking our porridge. Try a dollop of the compote with it; you might feel a bit more like you’re in May, not February. Wear your best Sou’wester with your jim-jams if you’re determined to eat it al fresco. We’ve got new season asparagus and rhubarb coming through in the vegboxes, but when the weather’s this wet we still feel like a bit of comfort food. There’s been much talk of roast dinners and cake on the menu chez Riverford staff (we talk a lot about food in the office, understandably). We’ve got two new recipes for our seasonal favourites that’ll give you a bit of a springtime cuddle in a bowl. If you’re up for a bit of baking on a wet Sunday afternoon, try our gingerbread with rhubarb and orange fool. For a quick midweek dinner, asparagus and bacon linguine fits the bill. Fifteen minutes max, from fridge to plate. Squashed herbs are optional. Back in the eighties, my first job was working in a French-style restaurant making steak tartare to serve to paunchy gentlemen in loose ties. There were lots of rum babas, a few too many black Russians and lots of hollering by the wonderful chef (RIP). I survived on avocados and marie-rose sauce. The memory prompted a little laugh this week while watching Masterchef when the actress Amanda Steadman said she ate avocadoes for days on the trot when she first tasted them as they were such a revelation. It reminded me there are variations of a recipe on websites and in cook books, a curiosity that had to be tried to prove its madness or genius. 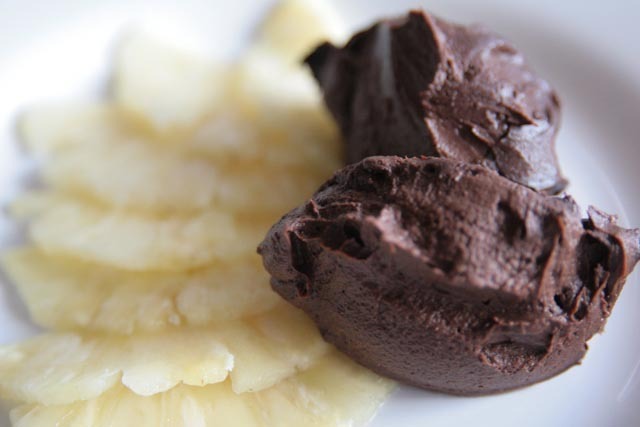 Chocolate avocado mousse. Dairy and processed sugar free, surely it couldn’t be right? Cacao and avocado were considered as stimulants by the ancient South American tribes, so I guess the combination comes from there. They were in some of the boxes this week, so if you haven’t made anything sensible with yours yet and they’ve turned a little ripe, give it a go and let us know what you think. 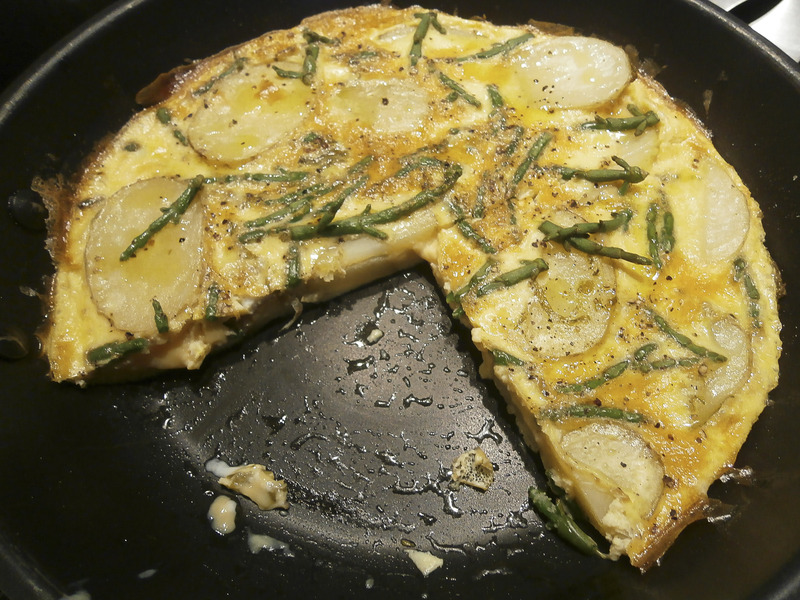 Serve with very thinly sliced pineapple, oranges or pink grapefruit. This makes about 5-6 ice cream scoops, so depending on how greedy you are, serves 2-4. It is quite rich, so one scoop is enough. 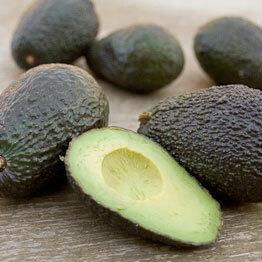 Cut the avocado in half lengthways and remove the stone. Scoop out the flesh with a teaspoon and put in a blender or food processor. Add the cocoa, honey or syrup and vanilla. Blitz until smooth. Add just enough water and blitz again until you have a smooth and creamy mixture. Taste, adding a touch more syrup or honey if needed. I also made another pudding this week, chocolate beetroot mousse. Try that one if you fancy doing some baking this week, or for Mother’s day.